Got my CDL training at a private school, paid for by my State Govt. in a program for laid-off or under-employed workers. (Was laid off from Oil & Gas Industry due to low oil prices.) Earned my plastic on first try at Gainesville, Ga. DDS on 4 April 2017. Started with Transport America, 1 May 2017, spent three weeks with two different trainers, now driving solo OTR hauling dry vans. Averaging 10k miles per month; wondering when do I shuck the 'rookie' title??? I need some advice, please! Colin, greetings from a 'rookie' who just completed his first year OTR! Woo-hoo! Experienced, but still learning something new every day! I wanted to throw in my 2 cents worth. 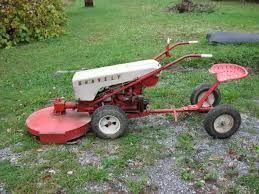 Growing up, we had a Gravely walk-behind mower. We had a sulky (seat) that attached with a trailer ball. And, we'd occasionally add a trailer (but behind the sulky, not shown in this picture), again attached with a trailer ball. 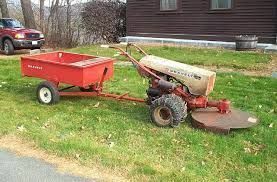 So, I learned early on how to back the equivalent of a double semi trailer as far as which way to 'push' the tractor handles to get the single or double trailer to go the way my father wanted it to go. It got a bit tricky but came in real handy when I went to truck driving school. Just remember, if you have any experience backing a boat or utility trailer, etc. it is basically the same, just with a different pivot point. Instead of equal length car/trailer combination and a pivot point in the middle, the semi trailer is a lot longer than the tractor. "SWIFT" = swing wide, it's a freaking trailer! I went to a private, 3-week school only because my State Govt. had a program to teach new skills to laid-off (my situation) and/or underemployed workers. (This is an option you may not have known about.) They paid for everything, including my three endorsements and license fee. After 40 some years of working and paying my taxes, I didn't feel the least bit guilty asking the Government to throw some back my way! The student/teacher ratio was 4/1 at each backing 'station' so it wasn't individual instruction per se, but it was low enough to be effective. I was having difficulty, as most new students do, at trying to figure out which way to turn the wheel. In the midst of the backing maneuver, with the added pressure of onlookers, etc. it was hard for me to instinctively know which way to turn the wheel. My pea brain couldn't 'do the math' quick enough to follow the instructors' mantra of 'proper' hand placement, turning into trouble, etc. 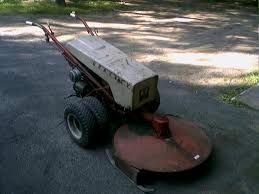 So, I resorted to what my father had told me as a kid backing up different types of trailers. Put one hand on the BOTTOM of the steering wheel and, while looking in either mirror, simply push your hand in the direction you want your trailer to go! Simple! No extra thought involved, none of the "ok, if I turn this way the trailer goes that way, so I have to turn the opposite way", etc., freeing you up to concentrate more fully on what is happening outside your tractor. Also, I didn't have to stop the maneuver to think about it and backing always seems to go better in one fluid, slow, motion rather than starting and stopping continually. It immediately made everything fall into place and I shared it with some of the other guys in my group who were really struggling with their backing and it seemed to help them also. I have used it throughout for my first year of driving, never felt guilty about not doing it "the proper way" and now thoroughly enjoy challenging backing maneuvers at tight shippers! I enjoy the challenge, the sense of satisfaction when completed, and it breaks up the boredom of a day spent rolling forward! One more word of advice.... the school I attended had weekday students (3 weeks, 5 days-per-week) and weekend only students (I don't know how many weekends it took them) but I took the initiative and showed up at the school at least 1 extra weekend day for three consecutive weekends. I used the time to go over and over and over my pre-trip inspection on the driving test trucks that were parked off to the side. Recognizing my initiative, the various instructors (who had to work weekends!) also managed to let me jump into rotation and take an extra turn or two on several of the backing maneuver stations. This helped me develop the muscle memory and familiarity necessary to pass the exams. I am proud to report that I was the only one, out of a class of 14, that passed pre-trip, backing maneuvers and road test on my first try! Got my plastic the first day and attribute it to the extra effort I put in. These initial driving/clutching/backing skills are difficult to master at first, but become second nature as you move on in your career to the advanced challenges of time management, winter driving skills, trip planning, etc. I hope that helps and best of luck moving forward. You seem to have the drive to succeed so keep plugging! I'm glad I'm not the only one who struggles with this issue of burning the 70 in 5-6 days and sitting for 34 or running 9 or so hours per day and having good recaps coming back, to keep rolling. I don't like to sit still for 34 (other than doing laundry, reading, haircut, grocery shopping, etc.). Uber seems to be a good alternative if you want to take in a ballgame or a movie while near a city and need a ride somewhere. One thing that has been real helpful to all involved, is checking with dispatch for local runs in an area where we don't have a terminal with day cab drivers. Sometimes relocating a local empty to a shipper or sitting for a live-load and then dropping it at one of our terminals for someone else to relay is a good way to use up any remaining hours you have on your 70 before taking a 34. Puts $60 in my pocket (minimum trip pay) and usually only takes a few hours. I live in Atlanta so finding incoming freight from anywhere in the country to get me home for reset is easy. Just plan ahead and let my freight manager know ahead of time that I'm gonna need a reset, and they get me loads that route me home. GET THE CAT APP for scaling your loads!!! Hands down, the most useful thing on my phone! Normal weigh procedure - roll onto scale, scream at person at the other end of the speaker, roll off scale, park somewhere other than in front of the scale (parking can take 20 minutes or more depending on time of day/night), walk inside, wait in line, give company info/truck-trailer info/credit card info/etc. to clerk, wait for printer to print, finally get a look at your axle weights. Back out to your truck, slide tandems if necessary, roll onto scale for re-weigh, park, repeat entire process - end result is lots and lots of wasted time. Wow, y'all ate my lunch! Living in Atlanta, I did have quite a few options to weed through. I spent the time to do my research and I don't regret it. Thankfully, earning immediate cash was not a pressing issue, so insurance benefits for my family was of more interest than cpm, for instance. If nothing else, I am confident I made the right choice (I'll update on that statement in about a month, then six, then 12!) and due to circumstances I had two weeks to kill before I could start orientation anyway. Put it to good use and got my TWIC renewed and all three endorsements done. Research eliminated quite a few companies right off the bat, but yeah, have to admit you can over-analyze the unknown and its still the unknown. I do appreciate the collective wisdom found on this site and looking forward to Monday morning to start my new adventure, realizing I don't know anything about the industry! ...and noone is asking a single question about how to maximize their time management skills, how to squeeze every minute of available time out of their logbook , how to build better relationships with the right people in their company, how to stay motivated enough to perform consistently at the highest levels, how to get loaded or unloaded early, or how to work their way into the higher paying and more elite divisions within their company. That's where y'all come in!!! First up is a better understanding of HOS and time management. It served me well as I applied to 17 companies, covered everything from 1st day of orientation through the first year of employment, and all but one recruiter didn't seem to mind my questions. Several said they had never been asked certain questions before, such as HSA vs. FSA on health plans, or 401k vesting schedule, etc. but were willing to provide an HR contact and phone number within their outfit to get my questions answered. At 58 years old and recently laid off from a lifetime in the Oil & Gas Industry, this ain't my first rodeo and I'm shopping for the best fit for my family. My needs are certainly different than most young guys entering this industry and I wasn't about to go in blind or ignorant. For what it is worth, some companies don't have a 401k program, profit sharing or stock options, but most do. Enrollment period for 401k and health benefits ranged from 30 - 90 days after hire. Matching contributions to 401k ranged from none (profit sharing returns only contributed to 401k in that company), to 50% match of up to 3% employee contribution, to the usual 50% match of up to 6% employee contribution, with some having an annual match limit. I got the full range of answers. So, it pays to ask. I even educated a few younger recruiters on the personal financial benefits of 401k plans in general and the differences/advantages of HSA & FSA health plan options. Like I said, this ain't my first rodeo and it is never too early to start saving for retirement as 401k's can grow to massive amounts over a lifetime of employment. And it ain't what you make, it is what you save, that matters. Rick, I appreciate your thoughtful responses. I tend to agree with you on the larger gross, itemizing on long form since I have to anyway, and abhor loaning the govt. money interest free for the year. By choosing per diem from the Carrier, they claim to be able to reclassify the full $63 per day IRS allowance from our mileage pay as opposed to us as individuals only being able to deduct 80% of that $63. I still don't think the numbers work out in our favor, even with that extra 20%. I already itemize every year (rental property, small business, etc.) so another form or two doesn't matter to me! I'll keep a log (obviously!!) and receipts for special clothing, cb radio, etc. that I need to buy for my new career. All in all, I'm thinking per diem ain't such a good deal for drivers! This is an awesome thread, and very timely, as I start my career as a rookie driver (with CDL from a private school) on Monday, 5/1/17. A lot of the first three days of orientation are administrative in nature and this decision, to accept or not accept per diem, is one of the choices I have to make. It is very helpful to hear it discussed in such detail; it makes the decision an informed one based on facts and easier to choose, depending on our individual circumstances. At the driving school I attended, all the instructors made a point of telling the students NOT to elect the per diem if it were optional and to look for another carrier if it was forced per diem. That is how strongly they felt on the matter. I am beginning to understand why! Thankfully, I have a degree in accounting and have always done my own tax returns (with TurboTax's guidance!!!) and can fully understand the implications. Hopefully this thread will help others to understand the implications. I start with TA on Monday, and their "take" on the optional per diem is as follows, and I quote (emphasis mine), "TA has adopted the IRS Per Diem allowance amount of $63.00 per day for meals and incidental expenses. Based off of your position history and where you park for home time, TA will calculate the number of days you are away from home. The number of days will then be multiplied by the IRS Per Diem allowance amount of $63 per day to come up with your weekly Per Diem amount. This amount will then be reclassified from your weekly earnings to be treated as non-taxable. 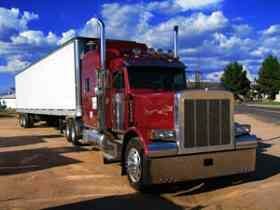 There is a reduction in mileage pay for Per Diem of .01 cpm. Per Diem will reduce the amount of taxes you pay and increase your take home pay. Per Diem is not subject to income or employment taxes. Under the Per Diem Pay Option a driver will have less record keeping responsibility for income tax purposes. TA assumes the responsibility with the IRS for the record keeping of these expenses." I struggled as well because I've always driven manual transmission vehicles, from the ole' Ford p/u 'three on a tree' (shifter on the steering column) that I took my teenage driving test in, to five speed on-the-floor shifters in later 4-wheelers. (That 5-speed shift pattern really messed with my head while learning the Eaton 10-speed pattern!) I also struggled with constantly wanting to push the clutch to the floor. It got better every time I practiced on the road during school. (We never left low (1st) gear and reverse in the yard as there wasn't enough room on the yard, so all shifting practice occurred on the road while you're also trying not to kill anyone!) That was my only complaint about the independent school I chose. Just like the first time you go snow skiing and seem to get the hang of it just before leaving the slopes, the next time you go skiing it seems so much easier. Same with shifting. I improved immensely each time, picking right up where I left off at the last go-round. I used three slightly flattened, full toilet paper rolls on the floor at home to represent the three pedals. It helped immensely by teaching my left foot the proper depth to plunge (tap) the clutch. I used half of my 10-ton floor jack handle for a shifter. Constantly repeated "clutch, clutch" on the upshift to get rhythm and shift pattern, then "BRAKE clutch.....FUEL clutch" to help me learn downshift rhythm. Emphasis (louder) on the words BRAKE and FUEL helped me with cadence and memory. (I would sometimes forget to brake the truck down to 1000 rpm before attempting to downshift which really screws up rpm's for continued downshifting.) I also found it very useful to constantly tell my instructors and then my DDS examiner what new gear I was in, which they liked, and mainly helped me remember where I was headed next during my road work. I never lost track of what gear I was in and it allowed me to concentrate my attention out the windshield. I also learned to grasp the shifter firmly (but not too tightly) with my hand directly on top instead of to the right side of the shift knob. This helped me find the gears better, helped me feel the spring tension better (the push from the R/1,6 grooves over to the 2,3/7,8 grooves) and also found that holding my right elbow a bit higher helped me go from 6th to 7th without ending up in 9th instead. The higher elbow gave me a straight forward arm movement instead of an angled push. Anyone reading this thread - be encouraged! In a month you'll be laughing at yourself over the ease of it all!